Lightswitch and 4Wall LA Light Nintendo’s 2017 E3 Booth | Press Center | 4Wall Entertainment, Inc.
Los Angeles- Last year, Nintendo transformed the floors of the Los Angeles Convention Center into the open world of the Kingdom of Hyrule, setting for the Legend of Zelda: Breath of the Wild video game. 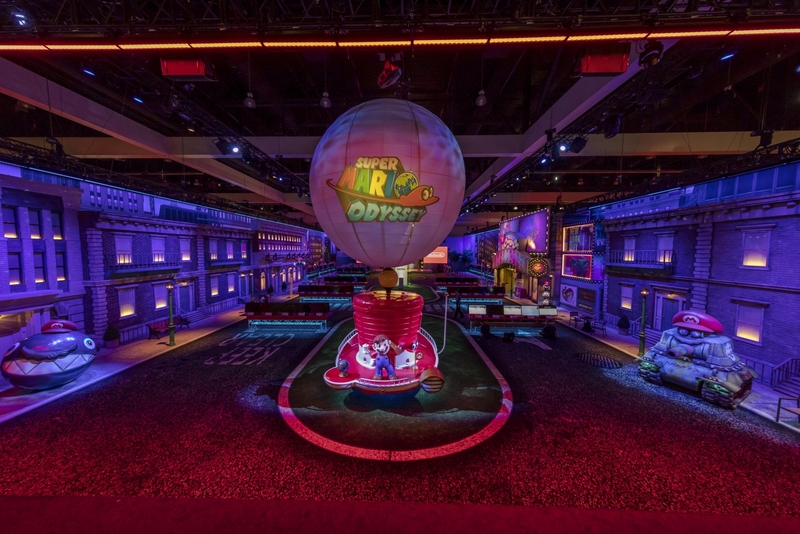 This year, they doubled down on the themed environment concept to warp their guests into a real-life New Donk City, a prominent region in the upcoming Super Mario Odyssey video game on Nintendo Switch. Ralph Miller Productions and lighting and visual design studio, Lightswitch, turned to 4Wall LA once again for an extensive lighting package consisting of over 500 fixtures. 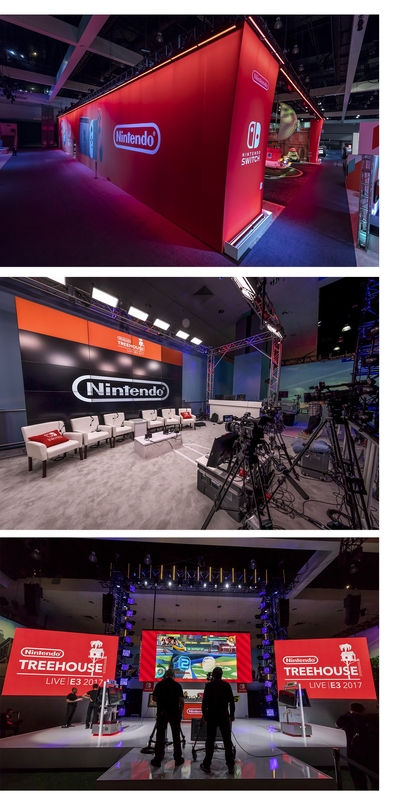 Lightswitch has designed Nintendo's E3 exhibit since the inception of the trade show. Lighting Designer Chris Medvitz along with his team from Lightswitch approached the exhibit more like a theme park than a traditional exhibit space. "For us this translated to a theme park lighting design approach that was heavy on scenic lighting treatments, and architectural details," explained Medvitz. "The immersive environment had a day-to-night looping cue structure that cycled every 30 minutes, complete with a sunrise, sunset, fireworks show and simulated thunderstorm." Numerous characters from the game were sculpted in full-scale recreations that were animated by lighting and sound effects triggered by guests stepping on sensors in the floor. "There were also literally hundreds of projection effects scattered across the city buildings, scenic backdrops, and 3D characters from six High End Systems DLHD fixtures positioned overhead," said the LD. "The animations were pulled directly from the game and used to add even more life to the experience." This year's E3 was the first open to the public. A record high of 68,400 people showed up to get their first glimpse of highly anticipated video games like Super Mario Odyssey. This year's exhibit was also the largest lighting installation for Nintendo to date. "We had 843 timecode cues in the 30-min loop, 40 Midi Input Triggers, and 53 cue lists," said the LD. "There were 29,000 feet of multicable and 30,000 feet of DMX cable. That's enough multicable to go up Mt. Everest, and enough data cable to go back down the other side!" 4Wall provided Martin MAC Aura XB and Martin MAC Viper Performance fixtures that lit the 200' of scenic building facades. Martin MAC Quantum Profiles along with the Aura XBs illuminated the center of the exhibit as well as the various 3D characters around the space. 4Wall's newly acquired Chroma-Q Color Force II LED battens lit 400' of scenic backdrops and 500' of exterior facades. "We had about 950' of Color Force IIs on this project and I can't say enough about them," said Medvitz. "They're sick bright, and the built-in split optical distributes light along a flat surface with a short throw much better than the previous version, and of course the best thing is the homogenized optics that eliminate seeing the individual LEDs which makes for a purer look." The exhibit featured Nintendo's own version of a music festival stage that hosted invitational championship competitive gaming tournaments throughout the show. The stage held Ayrton DreamPanel Twins, Clay Paky Sharpys, Clay Paky Sharpy Washes, Viper Performances, and Elation SixPars. 4Wall also provided a TV/Film lighting package for Nintendo's in-exhibit broadcast television studio, Treehouse Live, which streamed out content all day long for all three days of the show. The set was lit by Kino Flo Celeb 201s and Chroma-Q Color One 100 Pars. "4Wall once again did a fantastic job supplying the equipment for this exhibit," said Medvitz. "It's been a great partnership over the years that has made this challengingly large and complex project actually very easy for us to execute." Follow Lightswitch on Instagram and Facebook.